HARRISBURG – Pennsylvania House Republican members called on Gov. Tom Wolf to sign House Bill 59, the comprehensive Human Services Code bill that would help provide critical treatment to opioid abusers; prevent fraud, waste and abuse within the welfare system; pave a pathway to prosperity for those who can work; and save taxpayers hundreds of millions of dollars through reforms. Under Wolf, taxpayer spending for the Department of Human Services (DHS) now equals 38 percent of the overall state budget, and the Medicaid component itself accounts for almost 21.5 percent of the state budget. and save taxpayers hundreds of millions of dollars through reforms. 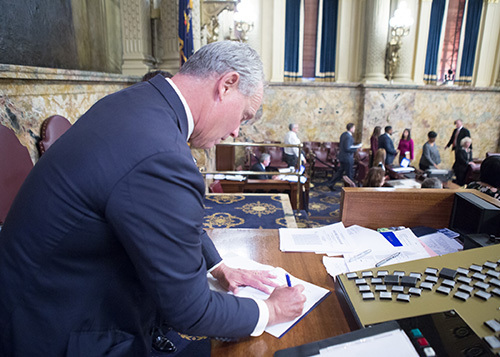 Despite a budget crisis that sees families struggling to keep up with the governor’s demands for more of their hard-earned dollars, Wolf has rapidly expanded entitlement rolls to record levels and now vows to veto this reform measure. House Bill 59 would control costs while providing access to those who truly need assistance. The bill would help fight the ongoing opioid crisis by requiring the Department of Human Services to submit a federal waiver so federal dollars can be used for opioid abusers’ treatment after 15 days of inpatient treatment, which is currently prohibited. The bill also extends provider submissions for child welfare placement costs, preserving nearly $31 million in federal Title IV-E placement maintenance funds. A veto of this bill by the governor would cause the Commonwealth to lose those funds. The bill would also require DHS to seek cost-saving waivers from the federal government prior to seeking additional funding from taxpayers. The bill also requires DHS to contract out evaluations of programs that will identify and prevent fraud, waste and abuse. House Bill 59 also seeks to pave a path to prosperity for able-bodied Pennsylvanians. In March 2017, the Centers for Medicare and Medicaid Services (CMS) sent a letter to state governors indicating it will begin to approve provisions related to “training, employment and independence” restrictions for Medicaid. Reasonable work requirements are intended to encourage self-sufficiency and ultimately lead to people being removed from the welfare rolls. The language in House Bill 59 directs the administration to pursue a waiver.